Built a strong foundation of identity through an ongoing process of wayfinding to engage in local, national, and global contexts. Students have the content knowledge and skills to be eligible to enroll in credit-bearing, postsecondary courses, workforce training and/or apprenticeship programs without the need for remediation, and complete them successfully. Students are able to navigate through postsecondary program selection and admissions, possess the knowledge and skills to enter into and thrive in a family-sustaining career pathway, and utilize strategies to resolve problems and improve academic performance. Wayfinding: Students are able to identify their kuleana and work hard to fulfill these responsibilities to their families, ‘āina, community, and future and past generations. Students know what makes their communities unique and become more involved through opportunities such as volunteer service, ecological stewardship, and civic engagement. Hawaii allows students to earn dual credit in academic and/or CTE dual-enrollment courses through Running Start courses offered at a postsecondary institution. Public postsecondary institutions are required to accept these credits (Education Commission of the States, 2015). 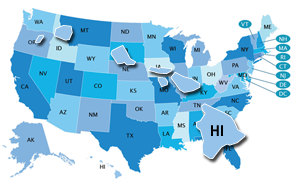 Hawaii is not participating in the Early College High School Initiative (ECHSI). More information about schools participating in ECHSI is available at the ECHSI website (Jobs for the Future, n.d.). In 2011, Hawaii mandated that all students in Grades 8–12 have a Personal Transition Plan (PTP) (U.S. Department of Labor, 2013). The PTP should include goal attainment planning, identification of available resources needed for success, evidence to support the plan of action taken, and student self-evaluation. Student, parent and school personnel have a shared responsibility in the development and execution of the PTP during high school. Periodic PTP review by the student, school staff member, and parent and/or guardian is required (Hawaii State Department of Education, n.d.). 8.0 (physical education [1.0], health [0.5], personal transition plan [0.5], from among world language, fine arts, and career and technical education (in a single pathway program of study) [2.0], and other electives [6.0]. Senior Project may count toward 1 elective credit. Certain programs, such as nursing, social work, education, and others, may have different admission requirements than those listed above. Hawaii’s state-specific Early Warning System is called the Early Warning System. Early Warning System data are reported at the student and school levels. It is not publicity available who can access the Early Warning System data.